For the golf-hungry traveller aiming to keep their scores low and spirits high, there is little better than hitting Florida’s sun-soaked fairways. Whether it’s holing up in a swanky stay-and-play haven or exploring the links at local pay-as-you-play clubs, there is plenty to please those eager to unleash their inner Tiger, Justin or Henrik. Boasting over 1,250 courses – many of which are ranked amongst the best in the US and open to the paying public – The Sunshine State hosts some of the nation’s most famous tournaments and also attracts the world’s greatest golf architects. For the discerning player, life doesn’t get much better than this year-round golf paradise for a heady of mix of exceptional golf, adrenalin-pumping theme parks and blissful beachlife. Whilst you can tee off 365 days of the year, green fees are dependent on seasons; the premium winter months are the most expensive, with prices considerably cheaper in September and October, April and May, and in the height of summer. Just be sure to check the T&C’s with each course prior to booking (some clubs require a handicap certificate) and ensure that your hire car is large enough to accommodate your clubs. For golfers accompanied by non-playing partners and offspring, Florida delivers. Passionate players can spend an inordinate amount of time smacking the little white ball around guilt-free whilst their savvy partners have fun maxing out their credit card. While you kick back and enjoy a hole-by-hole dissection of your game, they can indulge their shopping fantasies, book Zen-like spa treatments and work on their tans. Located just minutes from the Magic Kingdom, The Grand Cypress is a luxurious resort featuring two award-winning championship Jack Nicklaus-designed golf courses; the challenging 27-hole North, South and East Course and the signature 18-hole, 6,773-yard New Course; created as a tribute to the Old Course in St. Andrews this links masterpiece features 12-foot pot bunkers, gorse mounds, stone bridges, double greens and a snaking burn on three holes. Accessible to resort guests and public players at limited times, green fees vary from £70 (May to September) to £90 (October and December). For resort residents, Villas of Grand Cypress offers spacious club suites and sprawling villas complete with state-of-the-art kitchens and bathrooms, large outdoor patios overlooking the fairways or waterways of the North Course, and designer-led furnishings throughout. There is much to impress those who care little for splashing out on private lessons with PGA Class A certified instructors at the on-site Academy of Golf. Diversions include tennis, horseriding, cycling, jogging, swimming, spa treatments, a 24-foot rock climbing wall and a superb selection of upscale dining options including Nine-18, overseen by award-winning gourmet chef Alan Gould. Alternatively, book a round at ChampionsGate Golf Club, a Greg Norman-designed masterpiece with two 18-hole championship courses with contrasting layouts. The American-style 7,128-yard National Course weaves its way through the lush rolling Florida plains and features sculpted bunkers, challenging water hazards, mature trees, spring-fed lakes and small-but-challenging putting surfaces. By contrast the 7,363-yard International Course is based around the region’s natural wetlands and has long carries, deep pot bunkers, tall grass-topped dunes, and large undulating greens. Green fees at both courses are at their cheapest after 2pm between Sunday and Thursday when prices start from £40. Located just 15 minutes from Walt Disney World, this Central Florida showpiece tempts further with the Leadbetter Golf Academy at ChampionsGate, a purpose-built teaching school with two putting greens, two chipping greens, state-of-the-art computer technology and expert one-to-one tuition. Non-playing guests staying at the sumptuous 720-room Omni Orlando Resort at ChampionsGate can enjoy the spa, a pool with private cabanas, tennis courts and five restaurants. Facilities also include a games room, designated family pool with a 125-foot corkscrew, waterslide and water tower, and an 850-foot lazy river with shooting water cannons, arched waterspouts and a waterfall. To combine golf with the dazzling Disney experience, Walt Disney World offers three championship 18-hole courses and one 9-hole course, of which the much-lauded Magnolia is the longest. Designed by Florida-based architect Joe Lee, it features majestic magnolia trees, wide fairways, spacious greens, challenging water hazards and 97 bunkers – most famous is the Mickey Mouse ears-shaped bunker on the par-3 sixth hole. Green fees for Magnolia range from £23 to £100, depending on the time of year. The Palm, located next door, takes on a different identity with its Florida-style sprinkling of palms and ponds, whilst the beautifully landscaped Osprey Ridge (designed by renowned US golf architect Tom Fazio) is regarded as the most visually stunning of the four. For less-skilled golfers or parents with young kids, Disney′s Oak Trail Golf Course is a 9-hole walking course with a mix of par 3′s, 4′s and 5′s. With each of the courses earning accolades for their design and overall playability, all are open to the public and bookable online. Guests staying at a Walt Disney World Resort Hotel can book tee times up to 90 days in advance and also make use of the free taxi service to and from the courses. Approximately four hours south of Orlando and just a 14-minute drive from Miami International Airport, Trump National Doral Miami is home to the WGC Cadillac Championship. Boasting four challenging championship courses, the showstopper at this 800-acre resort is the recently renovated Blue Monster, a course that has played host to the PGA TOUR for almost 50 years and also seen many of the world’s greats struggle to break par. Acquired by celebrity hotelier and reality TV star Donald Trump in 2012, the resort (formerly known as Doral Golf Resort & Spa) has been given a spectacular $200 million facelift that includes a glamorous revamp of its 693 rooms and suites, a sprawling 48,000-square-foot spa with 33 treatment rooms, six signature restaurants, five swimming pools, retail boutiques, a private members’ club and the highly-esteemed Jim McLean Golf School. But beyond the opulence, a rich golfing history remains. The Blue Monster may steal the spotlight, but other crowd-pleasers include the Greg Norman-designed Great White course and the Red and Gold courses which both boast speedy greens and impeccable fairways. Green fees range from £45 to £210. 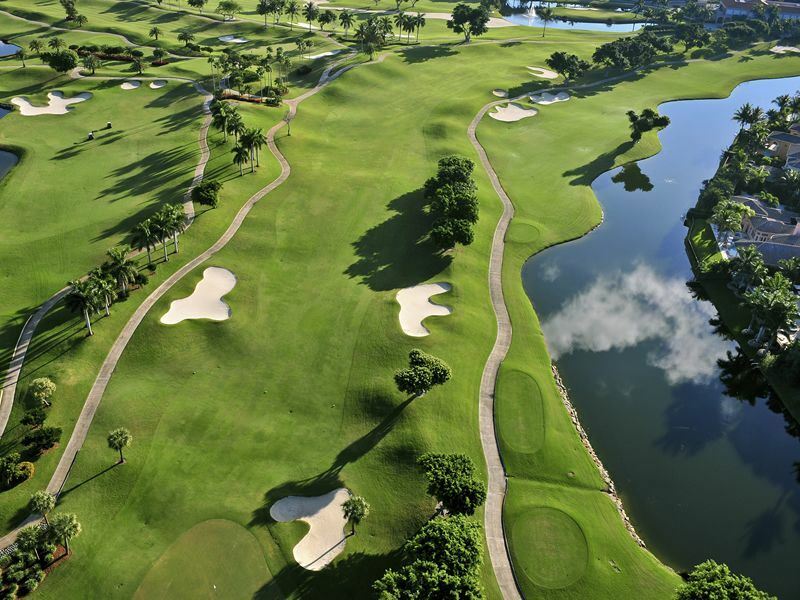 Just 90-minutes from Miami in Palm Beach Gardens, the PGA National Resort & Spa is an all-encompassing five-course complex that lures the golfing greats every February for the PGA TOUR Honda Classic. Each course in the portfolio has been designed by big-name golf architects: The Champion (Jack Nicklaus), The Palmer (Arnold Palmer), The Squire (Tom and George Fazio) and The Estates (Karl Litten). For the ultimate challenge, The Fazio (formerly known as The Haig) was completely renovated and modernised in 2012 by Tom Fazio II to include reconfigured greens and teeboxes, reshaped bunkers and a 70 per cent increase in total green surface to 2.5 acres. Green fees for The Fazio cost £210 on weekdays and weekends. For non-players, the resort hotel has enjoyed a $65 million renovation to include a celebrated spa offering 120 rejuvenating treatments, stylishly updated guestrooms and suites, a racquet club, three swimming pools, 19 tennis courts and seven restaurants including the signature Ironwood Grille. Located nearly two hours north of Orlando near to St. Augustine, World Golf Village Resort is the ‘Official Resort of the World Golf Hall of Fame’. Consistently receiving a four-and-a-half stars rating (out of five) by Golf Digest, it incorporates design collaborations by four World Golf Hall of Fame members and is home to two championship courses. King & Bear, named for its co-designers Arnold Palmer and Jack Nicklaus, is a picturesque 7,279-yard course set among lakes, Loblolly pines and 200-year-old oak trees. Green fees range from £41 to £100. Slammer & Squire, designed by Sam (The Slammer) Snead and Gene (The Squire) Sarazen is a 6,939-yard course that is characterised by two distinct nines with generous fairways, contoured greens, and plenty of water hazards. For golfers keen to improve their game, the onsite PGA TOUR Golf Academy is one of the most esteemed tuition schools in the US, serving as the training headquarters for all certified TOUR Academy instructors. At the heart of the World Golf Village Resort is The World Golf Hall of Fame, a 70,000-square-foot museum where the history of golf is brought to life through a series of permanent and temporary exhibitions. Showcasing over 4,000 artifacts, visitors can putt on a 1880s-style putting green with a wood-shafted putter and gutta-percha ball, watch some of golf’s greatest moments in the Great Championship Moments theatre and test their skills on a golf simulator that recreates some of the world’s elite courses (including the Old Course at St. Andrews). Admission costs £12 for adults and £3 for children aged five to 12. Opening hours are 10am to 6pm (Monday to Saturday); 12pm to 6pm on Sundays.